Check Out our Studs - our Boys are Gorgeous! 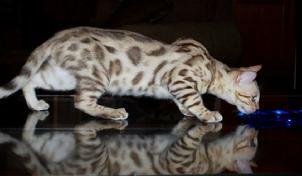 Our Stud cats' lineage have these Catteries in their parents and grand parents pedigrees: TheRealms Bengals, Koppiekatz, Leopardspride, Starglitter, Drinkwater, Stonehenge, Purreciouspots, Kajari, Tatsu, Legacie, Rising Sun, Anjalie, Amantra, Callista, Alluren, Googees, Millwood, and others. Meet our new Seal Sepia Snow boy! We are so excited to bring him to our Cattery. Since we love our Snow Bengals so much, we just couldn't resist adding two new boys, instead of just one. A big thank you to TheRealms Bengals for their superb bloodlines, their attention to the tested health and DNA of their Kittens and Cats, and for the work that it takes to have so many Show wins. More photos of our gorgeous new boy soon, as well as lineage and parent photos. Announcing another new addition to our Cattery! This handsome young guy has a lot of growing to do, but look for his Kittens in 2016. We will be very proud to have him at our Cattery. 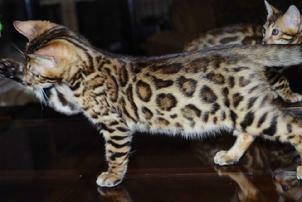 He has a lineage that will wow you and all of the right stuff to create show quality Kittens. More information and photos soon! 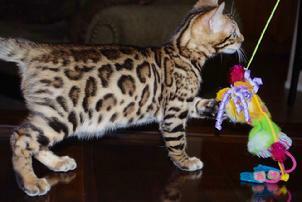 He also comes to us from TheRealms Bengals. This is... AustinBengals Pythagorean Purrfect... and unfortunately, we have quickly decided that he is not perfect enough for our breeding program, so he is now a happy house Cat. Very unfortunately, his facial features have evolved into very un-Bengal-like attributes and we have choosen not to pass on these attributes by using him as purchased to be a Stud. Thank you to Mary for giving him a happy home as a pet. He is a very sweet boy and a very happy house Cat. This is AbsoluteAngels Makulae and he is not only a very handsome boy, but has a superb lineage and has produced exceptional Kittens. Several potential new owners have been interested in Mak, but we just decided on the perfect match... so, Makulae is neutered and retired. Thank you to Tish and Michael for giving Mak the perfect new home. SantaFeBengal Romeo is only 15 weeks old, in this first photograph, and large for his age... and he has gorgeous, large rosettes, a clear honey background with high contrast and rufousing. Romeo is even better in his color and conformation than his famous father, Studman! As he has matured, his eye color has finally changed to a beautiful green and his pelt colorations have matured into the richest honey red and black-brown combination. 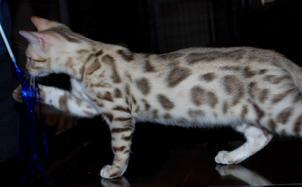 He is an amazing Marbled Bengal Stud Cat with very dark (black) marbling with the tri-color center and very clear pale honey background... all on a very muscular build. He has an excellent head shape and nice small ears. Barolo is such a nice boy! He is extremely friendly and loving... he even plays with Romeo (one of our top Studs) -- it is unusual for working, intact, Stud boys to get along so well. His colors are even better than this photo shows, plus he has the most intense green eyes... and how can you resist that gorgeous face? His name comes from a beautiful wine region in Italy. Click HERE to view photos of Barolo as a Kitten. Barolo has been retired and neutered... and he has gone to live with his half brother, Malbec! We are so very pleased that he will have the house Cat life that he deserves with Beth, Tom, and Malbec. Barolo is a very happy Hpuse Cat and he sleeps with us every night. 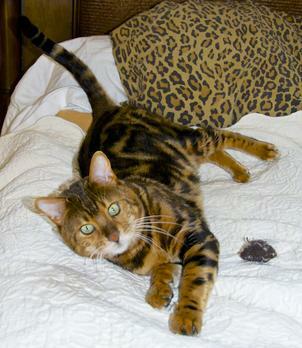 Barolo is friendly to every Bengal in the house and has lots of love to give a new family! Malbec has been a fantastic stud for our Breeding Program and is quite the "looker." In the photos shown here, he is just six months old. 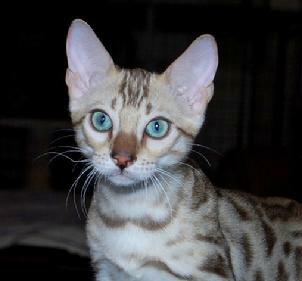 He has lovely coloring with nicely spaced rosettes and spots, and a lovely personality to match his good looks! Malbec (yes, named after the French grape varietal) is our largest Stud weighing in at about 13 pounds and he is all muscle. And just look at his intense golden eyes... We adore his loving and friendly personality. It is his turn to be a House Cat and we have retired Malbec. He is living a happy House Cat life with Beth and Tom. Click HERE for more photos of Malbec. STUDMAN HAS HUGE ROSETTES AND CLEAR BEAUTIFUL COLORING. 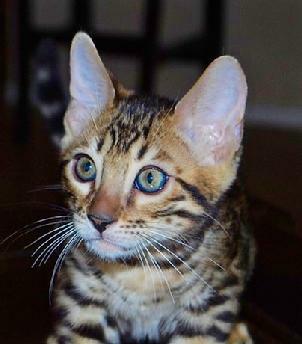 HE IS A GORGEOUS BENGAL STUD. Our beautiful boy is now retired. 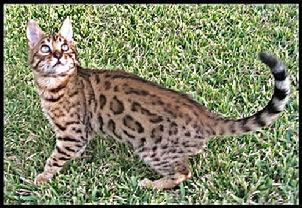 Bosquebengals Stud of SantaFeBengal - we call him "Studman" - has an impressive lineage and has produced Kittens with desirable large rosettes with rufousing. Studman has very intense gold eyes, superb coloring and confirmation, plus he has an engaging personality to match his good looks! We have retired Studman to give him a House Cat life. His two son's, Romeo and Malbec, have taken over for him. Studman is living happily quite near to us with Encarnita. Thank you for giving our wonderful boy such a great home!